Come join the growing numbers of scrapbookers and paper crafters who embellish their layouts with downloadable fonts. Simply download, install the font, and use on your titles, journaling, announcements, invitations, cardmaking and more. Spend a fraction of the time it would take to create your own lettering with computer fonts! Why spend your money on expensive die-cut machines, alphabets, or stencils when you can download a font, change the size, alter the color, and get exactly what you want for any layout every time? 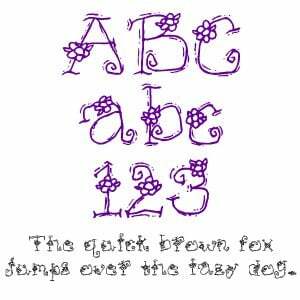 Get Scrapbook.com Fonts today! Pay once and use them forever! Never out of stock Windows compatible Each True Font includes all English numbers, letters, and the following punctuation: ' " : ; & . , ? ! Step 1: Order your fonts from Scrapbook.com. Step 2: Right click on the button after checkout and select "Save Target As...". Step 3: Save the file to a location you will remember, or write down where you've saved it. The font file is now saved on your computer. Step 4: To install the font, first go to the Windows Control Panel. This is located in your "Start" menu. For some, the Control Panel is found under "Settings" in the "Start" menu. Step 5: In the Control Panel, double click on the "Fonts" folder. In Windows XP, you may find the "Fonts" folder under the Appearance and Themes category. Step 6: From the "File" menu, click "Install New Font...". Step 7: Select the drive and folder where you saved the file in Step 3. Step 8: Select the font file from the "List of fonts" and click on "OK". Step 9: The font is installed on your computer. NOTE: You will need to shut down any open programs and restart in order to use your new fonts.